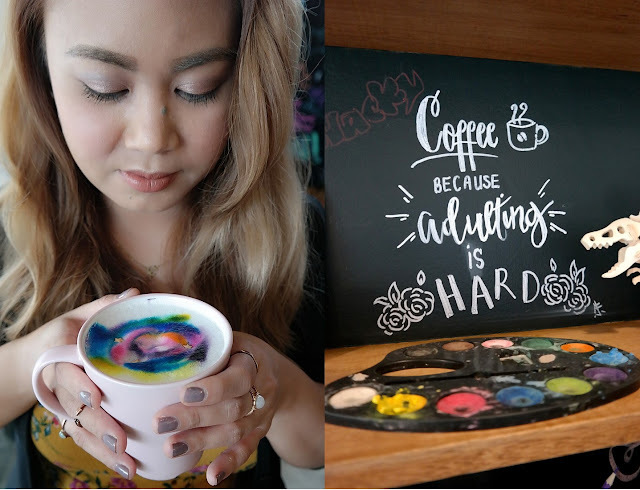 Whenever I am burned out, there are a few things that help me relieve stress: food, travel, art and blogging. Food, you know, that is so given ha! Even if I'm not stressed I always find comfort in it. Well who doesn't anyway? Travel, I do it as much as I can, if the budget and time permits it. As for arts and crafts, it is something innate; I would like to claim that I am very much into it, though I have to admit I have no mastery of any particular form of art. If you'll read my profile description on the right side bar of my blog, it says there that I love sewing, arts, crafts and to DIY almost everything. It is true up until this day. My family is very into these things from my uncles, aunts and siblings, we all know and love to draw and paint. My sister paints mostly on canvas and is a fashion designer, my brothers and youngest sister draw cartoons, while I, I love to scribble, doodle, do chalkboard art and make something from recycled materials and from scratch. Two of the things that I've been wanting to do and learn, under the arts category, are calligraphy and watercolor painting. That's even before it has gotten so big or famous. Calligraphy because my late grandfather was a calligraphy hobbyist; he owns a couple of authentic old school calligraphy pens and used to write names on diplomas etc. as a sideline. He even sent us a how-to-calligraphy book a couple of years back. Also, I want to incorporate that in my occasional chalkboard art sign projects. 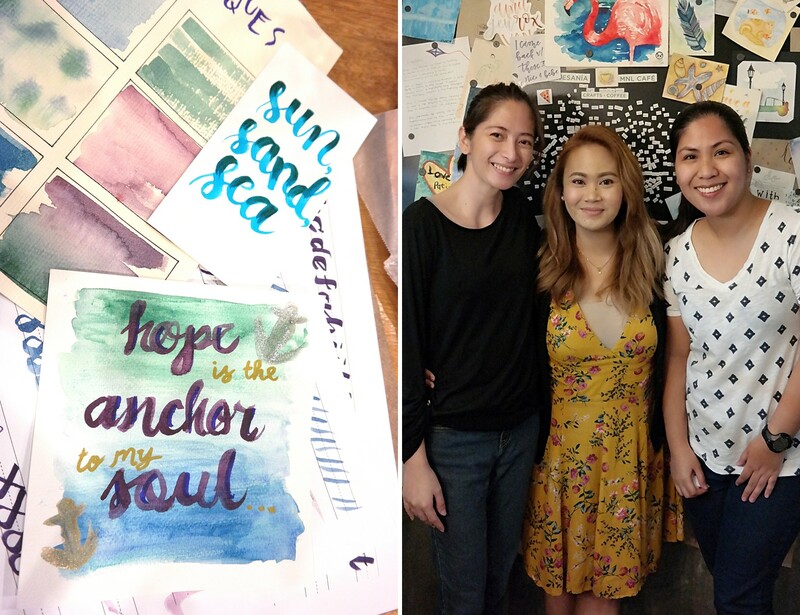 So I was so on board when I got invited for a calligraphy and watercolor basics workshop at Artesania MNL Cafe. Not only that I will be able to cross out two of my long-standing items in my life bucket list, but I also will be able to try dishes that they offer in their restaurant/art studio. It can't get any better than that right? Hitting two birds with one stone. One lazy rainy Sunday afternoon, my blogger friends and I trek all the way to Maginhawa Street in Quezon City to visit Artesania. Artesania means a couple of things: 1. Art and technique to manufacture or produce objects or products by hand with simple devices and traditional way. 2. Handcrafted 3. Arts and crafts. Artesania MNL Café was born out of the owners desire to have a place to escape the daily stresses in life and a comfortable place to meet your friends and loved ones to bond, "ArtTambay" and enjoy good food. They themselves are artists in their own ways and the moment you step foot inside the store the spirit of being artsy is palpable in every corner of the store. From their bulletin board to their storage areas lining the walls are filled with art and crafts displays and materials that clients can use and enjoy. From their pop-up physical menu book to the name of their dishes, the Arts in all of its form is just simply obvious and adapted. As you read on this blog post you will be enlightened to what I am saying. Potato Eaters - Dutch Artist Vincent Van Gogh considered this painting his most successful work, depicts of people who eats their potatoes they have manually tilled. And yes you deserve this as well. Fries palette with 4 colorful flavored dips. The fries are cooked well and crispy. The star of this snack though are the dips: Mustard, BBQ, Blue Cheese and Ketchup. Check out the blue cheese, it is literally blue but the taste is still what it is. This was very fun to eat! My favorite dips were Mustard and Blue Cheese (especially the blue cheese). Midsummer Night’s Dream - - Shakespeare Classic adapted into a salad by Artesania. This contains Romaine Lettuce, grapes, mangoes, tossed in honey mustard dressing topped with crushed sweetened pili nuts. This will surely remind you of Summer. And who can say no to mangoes? Yummy! Come on, Irene - Artesania’s Pizzas are 12-inches in diameter with thin crust. Artesania MNL’s Version of Dexy's Midnight Runners, an ode to Ivan and Irene who architects and co-owners of the store. This is their architect couple's favorite pizza. Flavorful garlic, shrimps, cheese, tomato sauce on easy and light crust. The Animal Farm - the owners named it as such because for them "Old McDonald" is over-rated (peace!) This thin crust pizza contains pepperoni, mixed sausages, adobo flakes and mozzarella cheese. It was a tie for the four of us between which pizzas we like best. Yong and I liked this all-meat while Neri and Ian went for the Come On Irene. Pesto by Golly Wow - this creamy pesto is part of the menu of Artesania that they will launch on their first anniversary. I love how straight-up this pesto is. My favorite pasta types are oil and cream based and my taste buds give this a two-thumbs up. It's creamy, earthy and the chicken chunks were of the right size. Galaxy Latte - these coffees are the reason why most clients are lured to Artesania, besides all the other things they have to offer. Served hot and comes in 2 size servings. I mean, hello, how can you not be intrigued? We all went "awww, it's so cute and beautiful" that we even don't want to drink them so as not to ruin the beautiful galaxy frosting. Iced Caramel Macchiato - besides mocha cafes I love my coffee sweet (just like my men, char!) with a kick of bitterness (not on my men though. Char again!) So this was definitely a winner for me! It's iced so I can drink it asap and give me that energy boost I always need. Plus, ain't this drink pretty or what?! English Toffee Latte - hot coffee on the sweeter side of the scale. This contains another favorite of mine which is toffee. Definitely satisfied this sweet tooth right here. Cucumber Lemon Sodas - a very refreshing drink that will remind you of lazy Summer afternoons and will make you long for the beach. Strawberry Lychee Iced Tea - even Artesania's drinks are artsy, in person, this drink has a cascading color or has that ombre-effect. That is why there's a stirrer together with the straw so you can mix it up before drinking. This iced tea drink is sweet-tangy and equally refreshing like the Cucumber Lemon Soda. While enjoying all these great food and drinks, we also learned the basics of watercolor painting with Ms. Elaine and calligraphy writing with Clarissa. After that we created our very first projects as return demos to our instructors. Both were easy and hard to learn and do at the same time; in just about anything practice is the key and as for the lady here, I need a lot of practice! Yet one thing is certain, it was one of the best foodie meet up I've attended ever! I freakin' enjoyed every minute of it! Pizza-All-You-Can > 12-inch, Thin Crust Pizza, P250 per Person, available from Tuesday to Friday. Petsa de Peligro Meals > costs P120. Affordable but filling rice meals. Para sa mga panahong tag-tipid pero stressed, kaya dapat kumain ng masarap. Artesania MNL is truly a one-stop shop where arts and good food meet, a nook for artists, crafters and local coffee addicts. More than just a café, it is a place to dream and kindle the artist in you as they offer various arts and crafts you can try during your stay. The café is also designed as a venue wherein artists can conduct workshops for those who would like to have a crash course in the field of arts. Check out the courses and activities that they offer on the slideshow below.